Lansing, United States - May 24, 2014 - The Michigan State Capitol as viewed from within Downtown Lansing, with trees, plants, office buildings, and pedestrians and cars and a driver in the foreground, and a blue sky with clouds in the background. After a flurry of last-minute activity, legislators headed home last week. They will be home for most of the summer and will return after Labor Day. During the summer legislative break, MRA’s government affairs updates will be sent on an as-needed basis. MRA members should expect election-related updates about candidates identified as Friends of Retail prior to Michigan’s Aug. 7 primary. 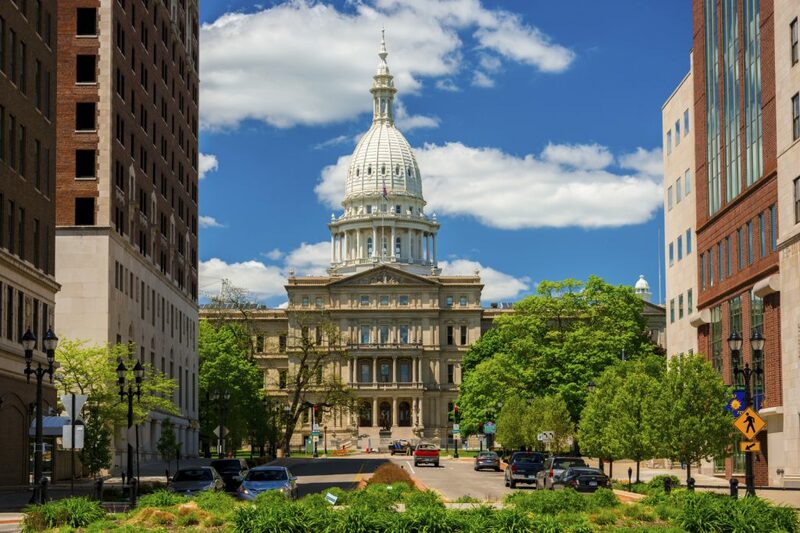 Before leaving, legislators checked off a few bucket list items including finalizing the budget, approving an initiated law that repeals the state’s prevailing wage law, adopting new work requirements for Medicaid recipients and adopting new standards in the wake of the Larry Nassar sexual assault scandal. The new standards extend the statute of limitations on when courts can hear cases of sexual abuse crimes committed against victims who are or were minors when the incident occurred. Current law allowed a criminal sexual conduct case to be brought within 10 years after the offense was committed or by the victim’s 21st birthday, whichever is later. Under SB 871-872, which were signed into law as Public Acts 182–183 of 2018, a case can be brought within 15 years after the offense is committed or by the alleged victim’s 28th birthday, whichever is later. If there is evidence of DNA, currently a case may be brought within 10 years after that identification. The new laws extend that timeline to within 15 years of identification. SB 872, which originally added a retroactive extension, was pared back in the House to apply rather narrowly to the Nassar victims. One of the items MRA was most closely watching in the waning session days before the summer break was HB 5805, a bill that MRA requested to modernize archaic statutory language related to prescription pricing when a substitution occurs. We’re thrilled to report the bill made it through the legislative process and is now awaiting the governor’s signature. The bill was approved by the Senate last Tuesday, the final session day before summer break. Next step: Governor’s signature. | MRA Position: Support. The Senate Transportation Committee recently heard testimony on its version of drone reforms, which are very similar to those the House approved earlier this year. SB 917–922 would limit the use of drones near key facilities, create a state office to advise officials and the public on drone regulations and clarify that a drone is considered an extension of the person using it. A proposed substitute for SB 920 would place a half-mile prohibition on drone use near key facilities. This provision ran into opposition from a representative from the Unmanned Aircraft Systems Task Force, the entity that crafted suggestions on drone regulations last fall. The opposition was based on the fact that any state-mandated airspace restrictions would be preempted by existing federal statutes. A drone manufacturer also expressed some concerns noting that regulating drone operation near key facilities would be better handled by a federal standard since that would prevent the state from having to readdress the issue with every new technological development. Next step: Senate Transportation Committee vote. | MRA Position: Monitoring with some concerns over the S-1 substitute for SB 920. The House Tax Policy Committee held a lengthy debate over HB 6049 in early June. The bill would make numerous revisions to who performs property tax assessments and how assessments are handled. Most notably, the bill would set new competency standards local governments must meet. If those standards are not met then the assessing must be done at the county level. The changes were predictably met with opposition from local governments and assessors. A workgroup is expected to meet over the summer to discuss potential changes and reforms. Next step: House Tax Policy Committee vote. | MRA Position: Monitoring. Alcohol distribution: Recently signed Public Act 178 of 2018 clarifies and codifies current rules on special licensees for events and addresses issues with product in high demand. HB 5768 allows a beer and wine wholesaler to skip the required hold period for products in high demand, getting products on the shelves for retailers quickly. The revised law took effect on June 11. Next step: None. | MRA Position: Support. Halal/Kosher labeling: Legislation recently introduced as HB 6119–6120 would mandate stores selling Halal and/or Kosher products post a sign stating the basis upon which the food was prepared. The bills include fines of $500 first offense and $1,000 secondary or subsequent offense for failing to post the required sign. The sponsor introduced the bills in response to issues with foods being represented as Kosher or Halal but not being prepared properly to meet those standards. MRA opposes mandatory posting requirements but is open to discussing other means to prevent false advertising. Next step: House Agriculture Committee. | MRA Position: Oppose. Marijuana-infused alcohol: The House Regulatory Reform Committee heard testimony on June 6 on SB 969, a bill that would ban the sale of marijuana-infused alcohol. The committee did not vote on the bill and will not have another chance to until the fall. Next step: House Regulatory Reform Committee vote. | MRA Position: No position. Substance abuse hotline: Legislation recently introduced as SB 1041 would require prescription medication labels to include a substance abuse hotline telephone number. MRA opposes this new requirement because there is not enough room on prescription labels to include this information, which could be presented in a different way to achieve the same results. Next step: Senate Health Policy Committee. | MRA Position: Oppose. Electric skateboards: The Senate recently approved HB 5391, a bill that would allow the use of electric skateboards on Michigan roads with speed limits under 25 mph. Kids under 12 wouldn’t be allowed to ride electric skateboards and kids between ages 12-18 must wear a helmet. Next step: Governor’s signature. | MRA Position: No position. Pyramid schemes/direct selling entities: Snyder approved legislation last week (HB 5726-5729) that clarifies what is and what is not considered a pyramid scheme. Public Acts 186–189 of 2018 strengthen state law to stop bad actors and will help clear up public confusion over which direct selling companies are legitimate. The bills will take effect on Sept. 9. Next step: None. | MRA Position: Support. Contact lenses: Legislation to exempt contact lenses from sales and use taxes was reported by the Senate Finance Committee in early June. The bills, SB 1026–1027, deals with the sales tax exemption for prosthetic devices and modifies the current definition of prosthetic device, which specifically excludes contacts. Next step: Senate floor. | MRA Position: No position. Use tax responsibility: The House recently approved SB 887, a bill that seeks to clarify who is responsible for sales or use tax when a property owner supplies material that will be used by contractors. The bill clarifies that the tax liability for tangible property purchased by another person and provided to a contractor for installation is the responsibility of the purchaser, not the contractor. Next step: Governor’s signature. | MRA Position: Monitoring. Bicycle passing distance: MRA members with employees who do deliveries or transport products should note that the legislature approved two bills (HB 4185 and HB 4265) that requires drivers to pass cyclists at a distance of at least three feet when possible. Next step: Governor’s signature. | MRA Position: No position. Buy American resolution: The House approved a resolution in early June (HR 339) urging the President of the United States to aggressively enforce the terms, conditions, and intent of the Buy American Act and to urge no waivers to the act be granted. Next step: None. | MRA Position: No position (resolutions have no real impact).